Steelers receiver Antonio Brown is coming off a three-touchdown performance last Sunday, while Bengals running back Jeremy Hill will be looking to keep Brown off the field as much as possible. Here are three keys to the game for both the Steelers and Bengals. Without a shutdown corner, the Steelers should double-team Green on every down. Cincinnati has other weapons in the passing game, but with Tyler Eifert coming off a pinched nerve, the Steelers should look to take away its best weapon and take their chances with Eifert and Marvin Jones. The Bengals’ logjam of cornerbacks is suddenly a shortfall due to injuries to Adam Jones, Leon Hall and Darqueze Dennard. Hall (back) is likely to return to the lineup while Jones (foot) has already declared himself out. Ben Roethlisberger should throw the ball all over the field early and often to take advantage of the Bengals’ depleted secondary with his slew of weapons. The Bengals’ defense is going to be gunning after Roethlisberger to keep him uncomfortable in the pocket. Todd Haley should call quick hitters and bubble screens to counteract the Bengals’ blitzing and keep them honest. The best way to quiet the Steelers’ offense is to keep them off the field. Jeremy Hill is coming off his two best games in terms of yardage. Offensive coordinator Hue Jackson should feed him plenty to grind down the Steelers defense and the clock. Dre Kirkpatrick and whoever else is playing corner for Cincinnati should look to be physical with Antonio Brown and Martavis Bryant at the line of scrimmage. 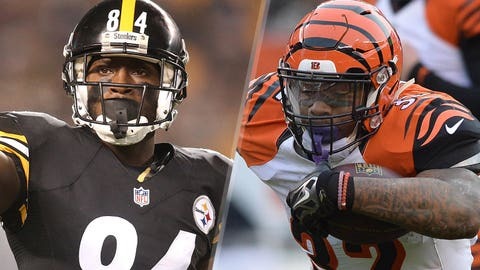 Getting a good jam is crucial to disrupting the timing between the duo and Roethlisberger, and will give rushers Carlos Dunlap and Geno Atkins a little more time to get after the quarterback. With Brown back to returning punts, the Bengals need to keep the ball out of his hands as much as possible. Punter Kevin Huber needs to make good use of his directional kicking skills since the last thing Cincy needs is to allow a touchdown on special teams.